Looking for an excuse for a multi-day ride? You might try a Lap of Washington. Staying as close to the border as practical, you will experience the immense diversity that Washington offers. Riding around the state counter-clockwise will ensure you are even that much closer to the border. Your lap will be around 1,600 miles and can be done in four days if all you want to do is ride. A week will give you much more time to explore. Planning your route is much of the fun, but the following tips may be of help. Western Border. From Seattle, jump a ferry (you do know you can jump to the front of the line, don’t you? I’ve stopped and explained to two riders in the last month that they can skip the line and get in front. Check the WSF site for more information.) After the Hood Canal Bridge catch the first right and ride Paradise Bay and Oak Bay roads to avoid Highway 104. If you don’t want to go all the way to Port Townsend then Swansonville Road and Egg & I Roads can be fun. Dungeness Bay north of Sequim is worth the effort. The Hi-Way 101 Diner or Oak Table Café offer great food if you are already hungry. Back on Hwy 101 make sure to stock up on all your Twilight swag in Forks for the young adult fiction fans you know. The lunch line at Sully’s Drive-In is usually long, but it moves quickly and the food is worth it. 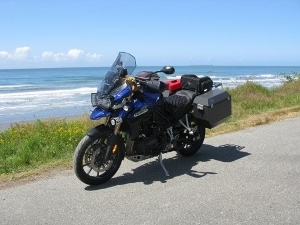 South of Lake Quinault, turn right onto the Moclips Highway and ride out to the shore where it’ll meet up with Hwy 109. Heading south on Hwy 109 means a slow pace as you pass through small towns and resorts along the water. At the south end feel free to explore Ocean Shores before heading back to Aberdeen on Hwy 101. Long ago the Washington Legislature approved extending Hwy 109 north through the reservation to meet up with Hwy 101 just south of Queets. Don’t hold your breath for this extension. 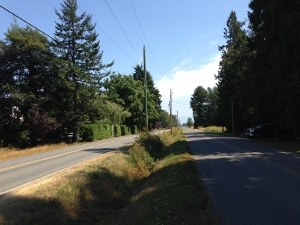 After Aberdeen ("Come As You Are!”) it’s back to the coast on Hwy 105 towards Westport. If you’ve never had reason to head to Westport, you’ve probably bypassed this road. It’s not an unusually picturesque region, but then certainly no worse than the portion of Hwy 101 that parallels this section. Hwy 105 ends at Raymond. Check your fuel gauge as Raymond and South Bend will be your last chance for gasoline until you get to Long Beach. Long Beach is a good point for a night over. Many hotels and dining (Hungry Harbor, Benson’s By The Sea, Loose Kaboose Diner, …) but make sure you have a reservation during a summer weekend. There are too many dark store fronts since our Great Recession, but still many shops and "museums” to peruse. 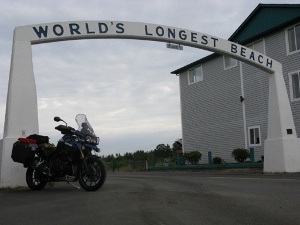 Leaving Long Beach you will want to ride south through Cape Disappointment Park on North Head and Robert Gray roads. If you’ve overnighted in Long Beach and get an early start, you will have these park roads to yourself and maybe a few joggers. What a wonderful experience! Southern Border. From Ilwaco your only choice will be Hwy 4 along the Columbia River to Longview. From Longview to Vancouver the obvious choice is Interstate 5 but if you REALLY want to stay close to the border try Dike, Kuhnis, and Fruit Valley roads closer to the Columbia River. After Vancouver the choice is again made for you: Highway 14 (Lewis & Clark Hwy). If you’ve ever been to the Rally in the Gorge you will already know many of the great restaurants in Stevenson (Big River Grill, Joe’s El Rio, Walking Man Brewery, …) and Bingen (Solstice Wood Fire Café). A very good idea to check your fuel in Bingen as it may be a long way until you see another gas station in Washington although there is plenty of gas on the other side of the river in Oregon. 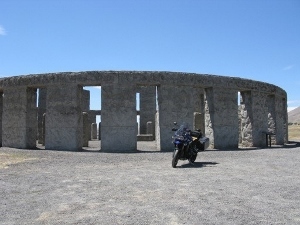 A mile or so east of Hwy 97 you must take a right and get your picture at Washington’s Stonehenge Monument. At Interstate 82 you have a choice: which way to Kennewick? The interstate or explore the farm roads. All is good. From Kennewick to Clarkston Hwy 12 will be the wise choice. However, if you are on a dirty worthy machine you can break away from Hwy 12 at Dayton and turn on to Patit Road. Use a Benchmark Atlas to route through the smorgasbord of road names ending in "Gulch” until you find Peola Road. The dirt roads can be steep and rain storms come quickly here. Ride with a buddy or at least a SPOT Tracker as it’s highly unlikely that you will have cell service. Most of the dirt roads are two lane but we’ve seen two tracks, too. Only you know your abilities on your bike so plan accordingly. Gas is available in Walla Walla, Dayton, and Pomeroy. The "station” at Pomeroy may be closed but you can still use the pump with a credit card. Eastern Border. Leaving Clarkston it’s time to cheat and briefly leave Washington to ride the Old Spiral Highway. You will only be in Idaho a few minutes and this twisty road is a must do for your bucket list. Adventure riders can instead ride Steptoe Canyon road further to the west. Street bikers that don’t want to step in to Idaho will need to get creative with their Benchmark map. As you look at your map be wary of roads that cross over dams – they may have been closed due to security concerns. Some are only open on weekdays. There are many possible routes from Pullman to Spokane. 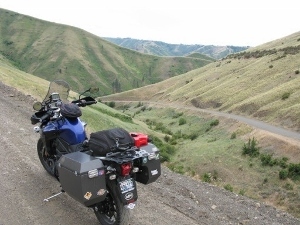 Hwy 27 meanders through the Palouse and is a perfect motorcycle road. but you CAN get closer to the border if you want. A fill-up in Pullman is your safest bet, but the small town pumps sure could use your business – if they are still open. Be careful north of Spokane making your way to Newport as Mt. Spokane will force you further east than you’d like. Most roads are paved but you may come across small dirt sections littered with marble-sized rocks. Make sure your tank and tummy are full before leaving Newport and Ione. It’ll be a while before you will be able to top off either again. From Newport, Hwy 20 is always a great choice but what about sneaking briefly in to Idaho again and taking Le Clerc road? It’s a very quiet and well paved road. Northern Border. For the most part you will not be close to the border until you reach Lynden in Western Washington. Adventure bikers can go up to Ione and ride Smackout Pass Road (which looked too narrow for my Explorer) or Meadow Creek Road to Aladdin Road to Northport and then Big Sheep Creek Road to Hwy 395. Ask locals and the forums about the condition of these Forest Service roads. Street bikes will stay on Hwy 20 and head north on Hwy 395 after crossing the Columbia. As if your ride hasn’t been epic so far prepare yourself for the next section: Boulder Creek Road to Curlew and then Kettle River, Toroda Creek, and Chesaw roads to Oroville. The roads and views are absolutely stunning. On the southern stretch of Oroville-Loomis Road dirt bikers can take Sinlahekin Road south to Conconully. And if you are really nuts and ready for adventure ride NF-42 to Loop Loop Pass. Beware: NF-42 continues to narrow as you head south. Just as you are convinced it has become a single track motocross trail you will turn, pass through a gate, and see a parking area at least four lanes wide. Whew. Small dirt bikes and ATV’s abound. NF-42 IS possible on a large adventure bike as long as you don’t need to turn around. And you’re nuts. Another alternative is to ride up the Toats Coulee, first west, then south on NF-39, west on NF-37 and into Winthrop. Not as populated, but the scenery is stunning and the road is usually in good condition throughout. Enjoy your ride on Hwy 20 through the North Cascades National Park. Take your time or else be ready to pay for your performance award. Visit the overlook at Washington Pass if you’ve never done that before. Awesome. Twisp, Winthrop, Mazama, and Marblemount offer gasoline. There’s excellent dining and ice cream in Winthrop. Marblemount’s Buffalo Run restaurant offers burgers made from beef, venison, ostrich, and, oddly enough, buffalo. North of Lynden you will want to work your way up to Boundary Road just east of Meridian Road. Boundary Road (US) parallels 0 Road (Canada) with a grass median just 3’ across. There is no border wall to keep crazy Canadians from invading. While security looks lax do not even think of jumping across. The Border Patrol is watching (See the cameras in the utility poles?) and does not share your sense of adventure/humor. You might want your passport along in case you trip and fall over the border. Northwestern Border. While you are in Blaine take time to visit Peace Arch Park. Heading west on D Street there is a traffic circle just past Big Al’s Diner (Yum!). Make sure to take the FIRST exit on the traffic circle to get to the park as the second exit will put you on I-5 right at the border crossing. From Blaine back to Clinton how close you stay to the water is up to you and your schedule. If you are a fanatic and want to stay closest to the border then circle around Lummi Island. High security at the BP Cherry Point refinery has closed some previous thru roads so avoid this area. Birch Bay Park and Chuckanut Drive are obvious motorcycle draws. Stop at a bakery in Edison. Marine Drive and Rosario Road is an alternative to Hwy 20 from Anacortes to Deception Pass. Watch Navy flyers practice touch and go landings at Ault Field Island as you take Ault Field Road over to Beach Road. This route allows you to avoid the congestion of Oak Harbor but you will also miss the restaurants. On South Whidbey, Smugglers Cove Road is always popular with bikers. Heading south from Mukilteo there are alternatives to Hwy 99 and, especially, I-5. Olympic View Drive and Sound View will get you to Edmonds. Woodway Park and Innis Arden are nice quiet residential roads worth exploring. Congratulations! After 1,600 miles and 5,000 feet of elevation change you are right back where you started. You’ve seen oceans, rivers, mountains, deserts, and thick forests as you’ve ridden urban and rural roads. Just across the border was Oregon, Idaho, Canada, and, if you imagined hard enough, Japan and Russia. More Laps. Get creative and you can always find an excuse to ride. Maybe this winter you can make an excuse for another lap: how about a Lap of Seattle on the smallest bike you can get your hands on? Jim Palms is Washington resident living in Seattle. He has owned countless motorcycles and explored the Pacific Northwest on two wheels for more than two decades.